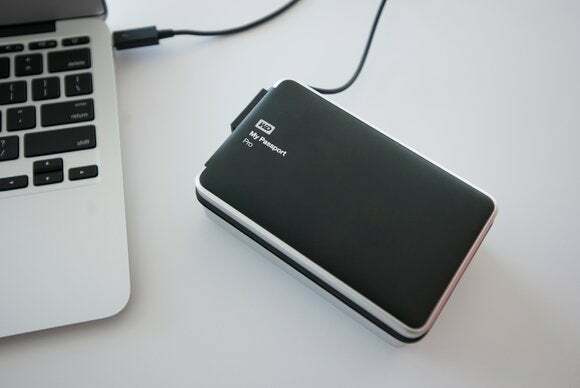 What's striking about Western Digital's My Passport Pro portable hard drive is its size and weight. 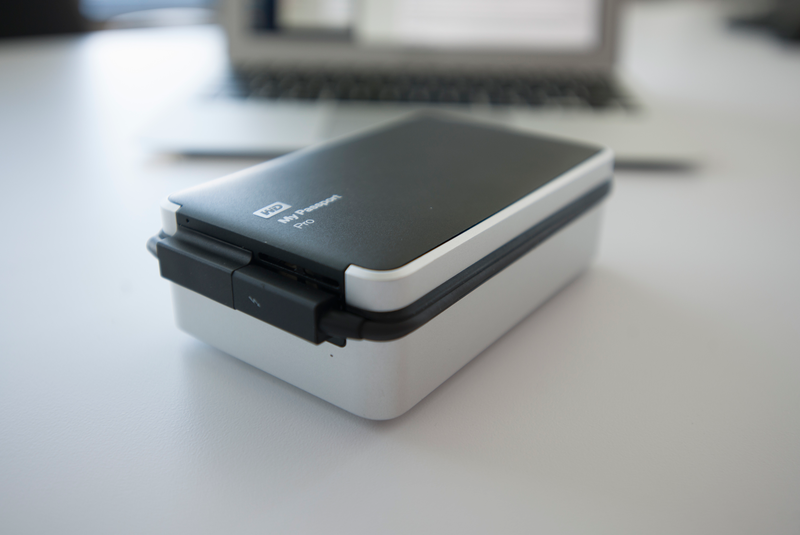 The 4TB version I tested weighs 1.58 pounds, which is light when compared to your average five-pound clay brick. The weight is due in part to the My Passport Pro's pair of 2.5-inch 5400-rpm drives, preconfigured in a RAID 0 for the greatest capacity and speed. You can, of course, use Disk Utility to configure the drive as a RAID 0, 1, or as independent disks. 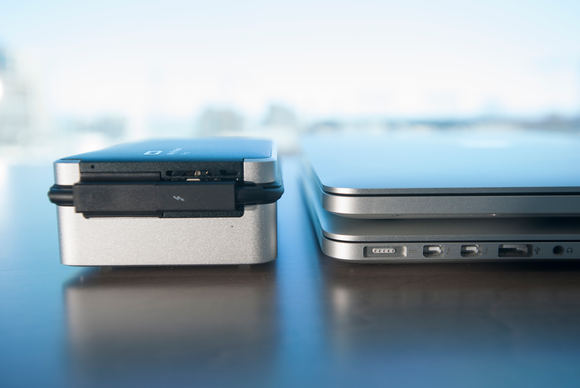 The My Passport Pro is thicker than two 15-inch Retina MacBook Pros stacked on top of each other. You don't need an external power source with this drive, but its heft may make you think twice about whether you really need to bring it with you. It's portable, but nowhere as portable as Seagate's Backup Plus Fast, another bus-powered 4TB drive. Compared to a desktop storage device, LaCie's Little Big Disk Thunderbolt Series is similar in size and capacity to the My Passport Pro, though it cost $70 more. 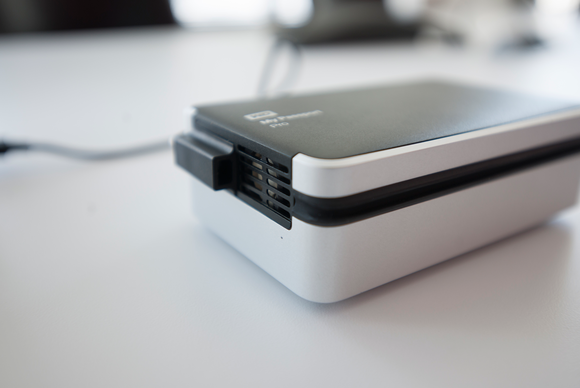 Although the LaCie drive does require a power supply, it is quieter than the My Passport Pro, and the LaCie drive has two Thunderbolt bolts, giving you more flexibility in a daisy chain. The My Passport Pro's tiny fan makes a lot more noise than you'd think. The My Passport Pro's aluminum enclosure is solidly built, and rubber bumpers on the inside help protect the drives from sudden impacts. The bottom of the drive has holes near the front for ventilation and a wee little fan in the back. The fan only kicks in when things get too hot inside, but when it does the noise is loud enough to get the attention of other people in the room. The My Passport Pro is not meant to be a rugged drive; dust, debris, and water have plenty of paths for ingress. The captive Thunderbolt cable tucks in a groove and then a slot to secure it durring transport. A captive Thunderbolt cable tucks into a groove that runs around the perimeter of the drive. Captive cables are neat if you tend to forget things all the time, like me. On the other hand, they have drawbacks: a fixed length, not user replacable, and a potential weak point for the drive case. Fortunately, the My Passport Pro's tethered cable is a reasonable length. You don't have to balance the drive on end or dangle it by the Thunderbolt connection—and given the weight of the drive, a dangling My Passport Pro may put stress on the Thunderbolt port. All drives are mechanical with 5400-RPM platters unless otherwise stated. In a RAID 0 configuration, the My Passport Pro performed about twice as fast as a single 2.5-inch 5400-rpm drive. Those speeds aren't anything to sneeze at, considering the portability and capacity that comes with it. However, those speeds are well within the performance range of USB 3.0 (5 gbps or 640 MBps), which makes a Thunderbolt connection seem rather overblown. If you absolutely need Thunderbolt, though, the My Passport Pro is there you. Hand it to Western Digital for trying new things. It's cool that there's a portable software RAID solution available, and bus-powered storage options with 4TB capacities are few and far between. Western Digital also offers a 2TB version of the My Passport Pro, which is lighter and not as tall. If it's 4TB of space you're after, Seagate's Backup Plus Fast is smaller, lighter, faster, and cheaper, albeit restricted to RAID 0 and connects via USB 3.0. The My Passport Pro has some good things going for it: a huge capacity, ability to create a RAID from the internal drives, and a tethered Thunderbolt cable. However speeds are lackluster, which makes the Thunderbolt cable seem unneeded.